Mumford & Sons are a British band formed in 2007. The band consists of Marcus Mumford (lead vocals, electric guitar, acoustic guitar, drums), Ben Lovett (vocals, keyboard, piano, synthesizer), Winston Marshall (vocals, electric guitar, banjo) and Ted Dwane (vocals, bass guitar, double bass). Mumford & Sons have released four studio albums: Sigh No More (2009), Babel (2012), Wilder Mind (2015) and Delta (2018). Their debut Sigh No More peaked at number two on the UK Albums Chart and the Billboard 200 in the US, with Babel and Wilder Mind both debuting at number one in the UK and US, the former becoming the fastest-selling rock album of the decade and leading to a headline performance at Glastonbury Festival in 2013. The band has also issued three live albums: Live at Shepherd's Bush Empire (2011), The Road to Red Rocks (2012) and Live from South Africa: Dust and Thunder (2017). The band have won a number of music awards throughout their career, with Sigh No More earning the band the Brit Award for Best British Album in 2011, a Mercury Prize nomination and six overall Grammy Award nominations. The live performance at the 2011 Grammy ceremony with Bob Dylan and The Avett Brothers led to a surge in popularity for the band in the US. The band received eight total Grammy nominations for Babel and won the Grammy Award for Album of the Year. The band also won the Brit Award for Best British Group in 2013. Mumford & Sons were formed in December 2007 by multi-instrumentalists Marcus Mumford, Ben Lovett, Winston Marshall and Ted Dwane. Band members play acoustic guitar, drums, keyboard instruments, bass guitar, and traditional folk instruments such as banjo, mandolin and resonator guitar. The band name originates from Marcus Mumford being the most visible member, organizing the band and their performances. Lovett indicated that the name was meant to invoke the sense of an "antiquated family business name". 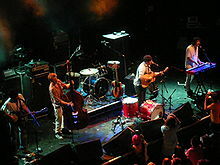 A handful of similar bands were increasing their visibility in West London around the same time, giving rise to the label "West London folk scene". Mumford downplays that characterisation as an exaggeration—Mumford & Sons and a few other folk acts just happened to be operating in the same general area at the time. In an interview with the Herald Sun, Marcus Mumford said, "It's not folk really. Well, some of it is, and it's certainly not a scene. Someone got over-excited about a few bands who live in a hundred-mile radius and put it in a box to sell it as a package. It's a community, not a scene. It's not exclusive." Having developed in the same musical and cultural environment, Mumford & Sons' sound has been compared to that of artists such as Noah and the Whale, Johnny Flynn and Laura Marling, whose backing band had included Marshall, Mumford, and Dwane. In early 2008, the band began working with manager Adam Tudhope, who, as part of management company Everybody's, also represents Keane and Laura Marling. It was through Tudhope's connection that Mumford & Sons were exposed to their future A&R at Island, Louis Bloom, who began monitoring the band. Bloom told HitQuarters that they were still at a fledgling state and not yet ready for a label deal: "There was no one there for it, just a few friends, and they needed time to develop. Over the next six months I kept going to see them and they were literally picking up fans every time." In February 2008, the band completed an extensive UK tour with support from Alessi's Ark, Sons of Noel and Adrian, Peggy Sue and others. June 2008 marked the band's first appearance at the Glastonbury Festival. They also toured Australia with Laura Marling, whose disinclination to interact with audiences encouraged Mumford into the spotlight. The experience helped inform his attitude towards Mumford & Sons audiences, which is to interact frequently and to try to create a comfortable, casual atmosphere. Mumford & Sons' first project was an EP entitled Love Your Ground which took a year to complete and was released in November 2008 on Chess Club Records. Throughout 2008 and into 2009, Mumford & Sons performed in small to moderate venues in the UK and US, exposing audiences to Love Your Ground tracks and other material that would eventually become Sigh No More. The band finally recorded Sigh No More with Markus Dravs, who had produced albums with artists such as Arcade Fire. At the time, band members did not even own their own instruments—Dravs initially turned them away when they showed up at the recording sessions empty-handed. The only track from Love Your Ground to be included on Sigh No More was "Little Lion Man". The band told the Herald Sun that they self-financed the album to avoid the artistic and technical compromises that sometimes befall studio-financed projects. They toured again in support of Laura Marling in 2009, and Mumford & Sons were contributing musicians to her 2010 album I Speak Because I Can. In August 2009, Mumford & Sons signed a licensing deal to Island Records in the UK, to Dew Process in Australia and New Zealand, to Glassnote Records in North America and Cooperative Music in the rest of the world, and through its own label Gentlemen of the Road. Dew Process boss Paul Piticco signed the band after witnessing a US performance in 2009 and appreciating their "honest" approach and unique sound. Their debut album was released on 5 October 2009 with "Little Lion Man" as the lead single. Dave Berry of XFM named "Little Lion Man" his record of the week, and in another interview with the band, Berry said "Screw 'of the week', it's my favourite track of the year." BBC Radio 1 DJ Zane Lowe made "Little Lion Man" his "Reaction Record" on 27 July 2009, before naming it the "Hottest Record in the World" the following evening. In their first performance on US network television, the band played "Little Lion Man" on CBS's Late Show with David Letterman on 17 February 2010. This appearance was followed by a performance of "The Cave" on The Late Late Show with Craig Ferguson on 26 February 2010. Mumford & Sons have been commercially successful in Australia and New Zealand. By January 2010, "Little Lion Man" topped the Triple J Hottest 100 list for all of 2009, with its margin of victory the largest in the history of the chart. In November 2010, the band won an ARIA Music Award for Most Popular International Artist. Sigh No More first reached number 9 on the New Zealand charts in October 2010, and subsequently topped the chart in January 2011 due to the popularity of the singles from the album. In a March 2010 interview, Ray Davies announced that Mumford & Sons would be appearing on his forthcoming collaborations album. Marcus Mumford confirmed this in an interview the same month, stating, "I am more excited about that than I have been about anything before in my life". Mumford & Sons performed the track "Days/This Time Tomorrow" along with Davies on 12 February 2010 on Later... with Jools Holland on the BBC. In December 2010, Mumford & Sons earned Grammy Award nominations for Best New Artist and Best Rock Song ("Little Lion Man"). While they did not go on to win an award, the band performed their single "The Cave" at the Grammy ceremony. The performance earned positive media attention and boosted visibility for Sigh No More—US sales increased by 99% in the period following the ceremony in February 2011. The album subsequently peaked at number two on the UK Albums Chart and the Billboard 200 in the US. On 7 December 2010, in collaboration with Dharohar Project and Laura Marling, Mumford & Sons released an EP album recorded in Delhi, India. The album was recorded in a makeshift studio with traditional Rajasthani musicians and features four collaborations, including multicultural mash-ups of Marling's "Devil's Spoke" and Mumford & Sons' "To Darkness." Sigh No More is certified 4x Platinum in the UK, and 2x Platinum in the US. The band continued to grow in popularity in 2011, winning several major awards and headlining larger shows and festivals. In February 2011, they received a European Border Breakers Award for their international success. They received a Brit Award for British Album of the Year with Sigh No More and performed "Timshel" at the ceremony. UK sales of the album subsequently increased by 266 percent. While touring the United States in early 2011, the band began writing songs for the follow-up album. Keyboardist Ben Lovett credited the creative atmosphere of Nashville, Tennessee with easing the songwriting process. While performing in Kansas City, Missouri on 3 June, the first stop of their US tour, the band announced they had been recording a new album, initially set to be released in late 2011. They then performed several new tracks from the forthcoming album, the title of which was not revealed. In April 2011, the group joined Old Crow Medicine Show and Edward Sharpe and the Magnetic Zeros on the inaugural Railroad Revival Tour, which was inspired by the Festival Express tour across Canada in 1970 that included Buddy Guy, Janis Joplin, The Grateful Dead and The Band. Travelling exclusively in vintage rail cars, the three bands performed in six "unique outdoor locations" over the course of a week starting in Oakland, California. Ketch Secor of Old Crow told American Songwriter that "It’s like we left all our baggage at home and just brought our instruments," often writing new songs while on the train. "We were just on these old rattling rails. It was a railroad odyssey that would have made Woody and Doc tip their hats and blow their whistles," he says. They appear in the musical documentary Big Easy Express, directed by Emmett Malloy, being made of the trip which premiered March 2012 at the South by Southwest Film Conference and Festival (SXSW Film) in Austin, Texas—winning the Headliner Audience Award. The film went on to win "Best Long Form Video" at the 2013 Grammy Awards. Mumford & Sons played at the Glastonbury Festival on Friday 24 June 2011, and then embarked on a North American tour on which they frequently performed songs from the upcoming album. They recorded two songs for Andrea Arnold's adaptation of Wuthering Heights, one of which (entitled "Enemy") is featured during the closing credits. In June 2012, Mumford & Sons contributed the song "Learn Me Right" with Birdy to the Pixar film Brave. Mumford & Sons released their second studio album Babel on 24 September 2012, with a track listing of 12 songs, and a deluxe edition containing three exclusive songs. The lead single "I Will Wait" premiered on Zane Lowe's BBC Radio 1 show on 7 August. On 29 August 2012, Mumford & Sons recorded their concert at Red Rocks Amphitheatre in Colorado. The Concert was later released on DVD, Vinyl and on iTunes as "Road to Red Rocks". The performance of "I Will Wait" from the concert was released ahead of the DVD on 9 September as the band's official video for the song. On 22 September 2012, the band performed two songs from the new album, "I Will Wait" and "Below My Feet", on Saturday Night Live. Babel debuted at number one on the UK Albums Chart and the US Billboard 200. It became the fastest selling album of 2012 in the UK, selling over 158,000 copies in its first week, and was the biggest selling debut of any album in 2012 in the US, selling 600,000 in its first week, and over a million worldwide. In December 2012, Winston Marshall told NME that the band was rehearsing and writing for their next album. The first phase of a 2013 world tour in support of Babel was released in November 2012. Their Gentlemen of the Road tour continued through 2013. After performing two shows on 8 & 9 June 2013 at the Austin360 Amphitheater in Austin, Texas, bassist Ted Dwane checked into a hospital the next day. Surgeons found a blood clot on the surface of his brain and performed surgery to remove it. Heeding medical advice to aid Dwane's recovery, the band cancelled the rest of its Summer Stampede Tour, including performances at the 2013 Bonnaroo Music Festival and returned to the UK. Dwane's surgery was successful, and his recovery was such that the band were able to headline the 2013 Glastonbury Festival on 30 June, with the band receiving acclaim for their performance. After first including select stopover cities in their 2012 Tour, the band again selected five cities in Canada, the UK and US to host a two-day festival with shows on multiple stages as well as various other activities and performances. The first stopover of the 2013 Gentleman of the Road tour was in Lewes, East Sussex, from 19 to 20 July. Next was Simcoe, Ontario from 23 to 24 August, followed by Troy, Ohio from 30 to 31 August. The band rounded out their tour with stopovers in Guthrie, Oklahoma on 6 and 7 September and finally St. Augustine, Florida on 13 and 14 September. The Vaccines, Edward Sharpe & the Magnetic Zeros, Vampire Weekend, Old Crow Medicine Show, Yacht Club DJs, Alabama Shakes and various other bands also performed at many of the stopovers throughout the tour. After the end of the Babel tour, Mumford and Sons took a five-month break before returning to the studio in February 2014 to start work on their third album. On 27 February 2015, the band released a short video teasing new live material, promising a further announcement on 2 March 2015 . It was revealed on 2 March 2015 that the third studio album from the band will be entitled Wilder Mind and will be released on 4 May 2015, with the first single "Believe" being released to radio stations on 9 March and available to download straight after. The announcement also confirmed a new series of Gentleman of the Road Stopovers festivals for Summer 2015. Mumford & Sons made their live return at the 375 capacity Oslo venue in Hackney, London on 10 March 2015 with an intimate show for family and friends. The band played again to fans on the following two nights, debuting songs from Wilder Mind. The second single from Wilder Mind, "The Wolf" premiered on BBC Radio 1 on 9 April 2015, and was made available to download straight after, with the official audio being uploaded to the band's YouTube channel. The official video, a live video of the band performing the song, was uploaded to YouTube on 13 April 2015. Mumford & Sons confirmed their return on 14 January 2015 with the announcement of a headline performance at the 2015 Bonnaroo Music Festival. Mumford and Sons headlined the Reading & Leeds Festivals in 2015. In the following weeks, many other dates were added to their 2015 UK & Ireland tour. On 30 April 2015, the band announced an intimate show at Brighton Corn Exchange exclusively to members of their mailing list. The gig took place on 1 May 2015. Mumford & Sons promoted their new album with several TV appearances and radio broadcasts, including a Live Lounge special for BBC Radio 1, The Graham Norton Show, Saturday Night Live on NBC, Later... with Jools Holland on the BBC the Late Show with David Letterman, and live streamed concerts for iHeartRadio and SiriusXM. On 13 April 2015, the band announced a 16-date North America tour in-between summer festival dates; the tour started on 2 June 2015 in Brooklyn, New York. For Record Store Day on 18 April 2015, the band released the coordinates of stores where fans could attend to listen to Wilder Mind in full on vinyl record, over two weeks before its release. The band also released a limited edition 7" record of "Believe"/"The Wolf" for the event. Wilder Mind was released 4 May 2015. Wilder Mind debuted at number one in the UK, the US and Australia. On 17 June 2016, Mumford & Sons released an EP titled Johannesburg. Delta was released on 16 November 2018, with appearances from Maggie Rogers, Yebba, and Gill Landry. The LP was produced by Paul Epworth, and was recorded mainly at The Church Studios in London. The band members play multiple instruments in live performances. 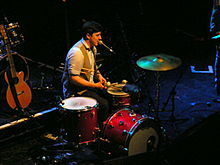 Here Marcus Mumford sits at a drum kit. Mumford & Sons have been described by The Hollywood Reporter and Forbes as a folk rock band. They began by using bluegrass and folk instrumentation, with the core instruments of acoustic guitar, banjo, piano and a double bass, played with a rhythmic style based in alternative rock and folk. In the documentary Big Easy Express, Marcus Mumford recognises the Old Crow Medicine Show influence: "I first heard Old Crow’s music when I was, like, 16, 17, and that really got me into, like, folk music, bluegrass. I mean, I’d listened to a lot of Dylan, but I hadn’t really ventured into the country world so much. So Old Crow were the band that made me fall in love with country music." Mumford acknowledges that "the band inspired them to pick up the banjo and start their now famous country nights in London." Ketch Secor, Old Crow front-man, concurs: "Those boys took the message and ran with it." Emmylou Harris was "among the gateway artists who helped Mumford and bandmates Ben Lovett, Ted Dwane and Winston Marshall discover their love for American roots music. It started with the 'O Brother, Where Art Thou?' soundtrack ... That eventually led them to the Old Crow Medicine Show and then deep immersion in old-timey sounds from America's long-neglected past." Much of Mumford & Sons' lyrical content has a strong literary influence, its debut album name deriving from William Shakespeare's Much Ado About Nothing. The track "Sigh No More" includes lines from the play such as Serve God love me and mend, For man is a giddy thing, and One foot in sea and one on shore. The title of the song "Roll Away Your Stone" is an allusion to Macbeth; the song includes the line Stars hide your fires/ And these here are my desires which borrows and pares down Macbeth's line in act 1, scene 4: Stars, hide your fires,/ Let not light see my black and deep desires. Additionally, "The Cave" includes several references to The Odyssey, in particular the sirens that Odysseus encounters on his journey home. The song also contains many references to G.K. Chesterton's book, St. Francis of Assisi, in which Chesterton uses Plato's Cave as a way of explaining how St. Francis views the world from God's perspective. "Little Lion Man" appears to be a retelling in dramatic monologue form of Chretien de Troyes' Yvain, the Knight of the Lion, which is the story of a knight who goes mad after betraying a promise to his wife to return to her. Both "Timshel" and "Dust Bowl Dance" draw heavily from the John Steinbeck novels Of Mice and Men, East of Eden and The Grapes of Wrath. The band's change in sound on their third album was described by Lovett as a "natural departure." At the end of the Babel tour Winston Marshall traded his banjo for electric guitar in sound checks and Mumford started playing more drums as the band jammed on heavy instrumentals and even some Radiohead tunes. Banjo does not feature on the record, an instrument that had become synonymous with the band. NME reported that the band's sound is "More expansive than ever and decidedly heavier, thanks to the shift in instrumentation." The group also employed a full drumkit instead of kick drum. "We've had our standard line-up of instruments for the last six years and we felt like that was our palette, [but] we started picking up other stuff," said Lovett. "It's a very natural departure from some of that rootsier stuff." Lovett told NME that working with James Ford for Wilder Mind was part of trying something new. "We felt a need for change. Not from Markus [Dravs], but he was so closely attached to those first two records that as we had taken that time off, we wanted to try doing something new. It felt like, if we do our third record with Markus, does that mean we do our ninth and 10th records with Markus? At some point you have to try different things, as we collectively felt like it was time to try other stuff. Markus knows that we might well make the next record with him. We definitely haven't broken up [with Dravs], we're just playing the field!" ^ "Ted Dwane's other band, Moulettes |". Mumfordandsonsblog.tumblr.com. Retrieved 2016-06-18. ^ a b c "New Mumford & Sons album Babel is fastest seller of 2012 in UK and US". the Guardian. Retrieved 28 September 2014. ^ a b c "Mumford & Sons' 'Babel' Scores Biggest Debut of Year, Bows at No. 1 on Billboard 200 Chart". Billboard. 3 October 2012. Retrieved 28 September 2014. ^ a b c d e f g h Betts, Marianne (25 March 2010). "Mumford & Sons have taken Australia by storm". Herald Sun. Retrieved 24 January 2011. ^ a b c "London – Radio – Mumford and Sons". Bbc.co.uk. Retrieved 28 September 2014. ^ a b Collis, Clark (4 March 2011). "Mumford and Sons: Ben Lovett talks about playing with Dylan, recording with Ray Davies, and high-fiving R. Kelly". Entertainment Weekly Music Mix. Retrieved 6 January 2011. ^ Walker, Tim (28 July 2008). "Mumford & Sons, The Luminaire, London". The Independent. Retrieved 29 December 2010. ^ Roberts, Lynn (12 March 2011). "From the archives: FFS interviews Mumford and Sons". For Folk's Sake. Retrieved 10 May 2015. ^ a b "Interview With Louis Bloom". HitQuarters. 4 April 2011. Retrieved 18 April 2011. ^ "Mumford And Sons: 'We were banished from studio by producer'". NME.COM. 12 August 2009. Retrieved 28 September 2014. ^ "BBC Sound of 2009: Mumford & Sons". News.bbc.co.uk. Retrieved 28 September 2014. ^ Lowe, Zane (27 July 2009). "Tracklisting – Monday 27 July 2009". BBC Radio 1. Retrieved 8 July 2011. ^ Lowe, Zane (28 July 2009). "Tracklisting – Tuesday 28 July 2009". BBC Radio 1. Retrieved 8 July 2011. ^ "Mumford And Sons censor 'Little Lion Man' for David Letterman". NME.COM. Retrieved 28 September 2014. ^ Gregg, Natalie (27 January 2010). "Aussies rock in Triple J's Hottest 100". The Courier-Mail. Retrieved 21 February 2011. ^ Collett-White, Mike (20 November 2010). "Mumford & Sons top ARIA Awards". Billboard 122 (46): p. 32. ^ "International Charts: Mumford & Sons' Sigh No More rallies around globe". Music Week: p. 28 (22 January 2011). ^ Uricheck, Mark (15 March 2010). "THE MUSICIAN'S VOICE: A Chat With The Legendary Ray Davies". Themusiciansvoice.blogspot.com. Retrieved 24 January 2011. ^ "BBC – Later live... with Jools Holland: Ray Davies & Mumford and Sons – Days/This Time Tomorrow". BBC. Retrieved 28 September 2014. ^ Gundersen, Edna (24 February 2011). "A Grammy performance is good for business". USA Today. Retrieved 6 March 2011. ^ a b "Mumford & Sons reach UK and US million sales landmark". NME.COM. 7 March 2011. Retrieved 28 September 2014. ^ "'Now 37' Livens Up Billboard 200 at No. 1, Mumford Climb to No. 2". Billboard. 16 February 2011. Retrieved 28 September 2014. ^ "British Certification database". Bpi.co.uk. Retrieved 28 September 2014. ^ "US Certifications database". Riaa.com. Retrieved 28 September 2014. ^ "Winners of the 2011 European Border Breakers Awards". Ec.europa.eu. 12 March 2012. Retrieved 28 September 2014. ^ Montgomery, James (17 February 2011). "Mumford & Sons write Sigh No More follow-up while touring US". MTV. Retrieved 7 March 2011. ^ "Setlist.fm 2011". Setlist.fm. Retrieved 25 September 2012. ^ Garvanin, Sinead (27 February 2012). "Mumford's railroad revival: The band boarded the Big Easy Express for a US tour with a difference". BBC Radio: 6 Music News. ^ Hoffman, Hannah (23 October 2012). "Q & A with Ketch Secor of Old Crow Medicine Show". The DePaulia. Archived from the original on 12 October 2013. Retrieved 25 October 2012. ^ "SXSW Film Announces 2012 Features Lineup; 'Big Easy Express' to Close Festival" by Nigel M. Smith, IndieWire.com; 1 February 2012. ^ a b Fernandez, Jay A. (19 March 2012). "SXSW 2012: 'Big Easy Express' Wins Headliner Audience Award: Emmett Malloy's film follows folk rock bands on the road" The Hollywood Reporter. ^ "The Official Site of Music's Biggest Night". GRAMMY.com. Retrieved 2015-05-05. ^ "Glastonbury Festival". BBC. Retrieved 25 September 2012. ^ Jagernuth, Kevin (23 May 2011). "Mumford & Sons Record New Song "Enemy" For Andrea Arnold's 'Wuthering Heights'". Indie Wire. Archived from the original on 27 May 2011. Retrieved 23 May 2011. ^ Bryko (1 May 2012). "First Details on 'Brave' Soundtrack! (UPDATE)". Upcoming Pixar. Retrieved 5 May 2012. ^ "Mumford & Sons announce details of new album, 'Babel'". Telegraph.co.uk. 16 July 2012. Retrieved 28 September 2014. ^ "Mumford & Sons' 'Babel' to be Released Sept. 25". The Hollywood Reporter. 17 July 2012. Retrieved 24 September 2012. ^ "Mumford & Sons track played for first time on Radio 1". BBC News. Retrieved 28 September 2014. ^ "LISTEN: Mumford & Sons unveil new single 'I Will Wait'". Clixie. 8 August 2012. Retrieved 17 September 2012. ^ a b "Mumford & Sons Match Grandeur of Red Rocks on 'I Will Wait'". Rolling Stone. Retrieved 28 September 2014. ^ Logan Nicklaus (23 September 2012). "Mumford & Sons Save the Day on 'SNL'". Rolling Stone. Retrieved 24 September 2012. ^ "Mumford & Sons: 'We're already working on new songs' 2012". NME. Retrieved 6 December 2012. ^ Studio Juice, Ltd. "Mumford & Sons – Live". Mumfordandsons.com. Retrieved 14 November 2012. ^ "BONNAROO & US TOUR – A STATEMENT FROM THE BAND". Mumfordandsons.com. Retrieved 28 September 2014. ^ "Glastonbury 2013 – review: Mumford and Sons give a triumphant performance on last night". The Independent. 2 August 2015. ^ "Gentlemen of the Road Stopovers 2013 – Mumford & Sons". Gentlemenoftheorad.com. Retrieved 28 September 2014. ^ a b Mumford & Sons – SOLD OUT (2015-04-06). "Mumford & Sons April 6th, 2015 | (le) poisson rouge". Lepoissonrouge.com. Retrieved 2015-05-05. ^ "Mumford and Sons taking a break". The Huffington Post. 21 September 2013. Retrieved 28 September 2014. ^ Kepler, Adam W. (22 September 2013). "Mumford & Sons Taking a Break". The New York Times. ^ Kat. "Mumford will start writing for new album". MumsonFans.com. Archived from the original on 22 September 2014. Retrieved 28 September 2014. ^ Kat. "Ben Lovett Announces his Engagement and Work on New Album". MumsonFans.com. Retrieved 28 September 2014. ^ Kat. "Mumford and Sons 2015 Tour to be Announced on Monday". MumsonFans.com. Retrieved 27 February 2015. ^ Kat. "Mumford and Sons' 3rd studio album "Wilder Mind" due out May 4th". MumsonFans.com. Retrieved 2 March 2015. ^ "Timeline Photos – Mumford and Sons". Facebook. Retrieved 2015-05-05. ^ "Tickets, Line-up, News & Info – Stopovers". Gentlemenoftheroad.com. Retrieved 2015-05-05. ^ "Mumford & Sons announce new album details and tour". Never Enough Notes. Never Enough Notes. Retrieved 3 March 2015. ^ "Mumford And Sons – Oslo". Oslohackney.com. 2015-03-10. Retrieved 2015-05-05. ^ "Instagram". Instagram. Retrieved 2015-05-05. ^ Kat. "Mumford and Sons Confirmed Headlining 2015 Bonnaroo Music and Arts Festival". MumsonFans.com. Retrieved 13 January 2015. ^ "Mumford & Sons Friday 28 Aug 2015 Main Stage". ^ "Home – Mumford & Sons". Mumfordandsons.com. 1970-01-01. Retrieved 2015-05-05. ^ "NME News Mumford & Sons announce mobile phone-free gig in Brighton". Nme.Com. 2015-04-24. Retrieved 2015-05-05. ^ 1 (2015-04-29). "Live Lounge Mumford & Sons". BBC. Retrieved 2015-05-05. ^ "BBC One – The Graham Norton Show, Series 17, Episode 4". Bbc.co.uk. Retrieved 2015-05-05. ^ "Taraji P. Henson with Mumford & Sons | Episodes | Saturday Night Live". NBC. Retrieved 2015-05-05. ^ "Later... with Jools Holland – Mumford & Sons". Mumfordandsons.com. Retrieved 2015-05-05. ^ "Later... with Jools Holland – Full Episode – Mumford & Sons". Mumfordandsons.com. Retrieved 2015-05-05. ^ "Mumford & Sons Kick Off CBS's Legends On Letterman: The online music series celebrates the amazing musical acts that have performed". CBS.com. 2015-04-15. Retrieved 2016-06-18. ^ "The Daily Show with Trevor Noah - Series | Comedy Central Official Site | CC.com". Thedailyshow.cc.com. 2016-02-09. Retrieved 2016-06-18. ^ "iHeartRadio Album Release Party with Mumford & Sons | iHeartRadio". News.iheart.com. 2015-04-28. Retrieved 2016-06-18. ^ "Mumford & Sons named their favorite songs by other artists! | SiriusXM Blog". Blog.siriusxm.com. 2015-05-07. Retrieved 2016-06-18. ^ "Mumford & Sons on Twitter: "North America! New summer tour dates announced! Tickets on sale 10am local time Friday 17th April. "". Twitter.com. 2015-04-13. Retrieved 2015-05-05. ^ "Mumford & Sons". Record Store Day. Archived from the original on 21 April 2015. Retrieved 2015-05-05. ^ "Forums Archive – Mumford & Sons". Mumfordandsons.com. 1970-01-01. Retrieved 2015-05-05. ^ Caulfield, Keith (2015-05-13). "Mumford & Sons Scores Second No. 1 Album on Billboard 200 Chart". Billboard. Retrieved 2015-05-13. ^ Hendicott, James (22 April 2016). "Mumford and Sons announce 'Johannesburg' mini album". NME. Retrieved 17 June 2016. ^ Keith Harris (16 June 2016). "Mumford & Sons's New Album: Johannesburg". Rolling Stone. Retrieved 17 June 2016. ^ "Mumford & Sons' Party Playlist, Katy B + Mumford & Sons, Radio 1's Future Sounds with Annie Mac - BBC Radio 1". BBC. Retrieved 2018-09-20. ^ Savage, Mark (2018-09-20). "Mumford & Sons 'grapple with manhood' for the first time". BBC News. Retrieved 2018-09-20. ^ Greenburg, Zack O'Malley (December 2016). "The World's Highest-Paid Musicians Of 2016". Forbes. Retrieved 14 December 2016. ^ Hight, Jewly (30 August 2012). "Old Crow Medicine Show: The Wheel Of Life". American Songwriter. Retrieved 5 September 2012. ^ Talbott, Chris (8 August 2012). "Old Crow Medicine Show starts new chapter with 'Carry Me Back'". The Tennessean. Retrieved 26 September 2012. ^ Talbott, Chris (26 September 2012). "Emmylou, Mumford & Sons team for 'CMT Crossroads'". Huffington Post. Retrieved 26 September 2012. ^ "MACBETH, Act 1 Scene 4". Shakespeare-navigators.com. Retrieved 24 September 2012. ^ a b "NME News Mumford & Sons say going electric on new album is 'a natural departure'". Nme.Com. 2015-03-03. Retrieved 2015-05-05. ^ Doyle, Patrick (2015-03-02). "Page 2 of Mumford & Sons Talk Going Electric on New Album 'Wilder Mind'". Rolling Stone. Retrieved 2015-05-05. ^ "Tickets, Line-up, News & Info". Gentlemenoftheroad.com. Retrieved 2015-05-05. ^ "Gentlemen Of The Road Stopovers 2015 - Mumford & Sons". Mumfordandsons.com. 2016-08-18. Retrieved 2016-12-08. ^ "One Sharp Cat: Nick Etwell". The Huffington Post UK. Retrieved 15 January 2015. ^ "ChessBoxer". Facebook. Retrieved 15 January 2015. ^ "Today Bexhill – tomorrow Glastonbury!". Bexhill Observer. Retrieved 30 June 2013. ^ "Brewed Aboard The Ark' The Leisure Society's Mike Siddell Brews Own Brand Beer". The British Guild of Beer Writers. Retrieved 3 July 2013. ^ "Brewed Aboard The Ark' The Leisure Society's Mike Siddell Brews Own Brand Beer". The British Guild of Beer Writers. Retrieved 15 January 2015. ^ "NME News Mumford and Sons to play festival shows with guest musicians after Marcus Mumford breaks hand". Nme.com. 2012-06-19. Retrieved 2015-05-05.